I think the focal point of most homes, irregardless of the house layout tends to be the kitchen. It’s the one room (like the bathroom one hopes) that you’ll visit at least once a day. 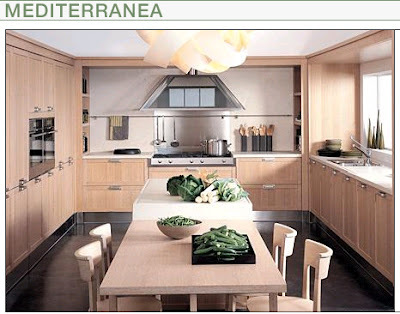 Hence the attention to detail and layout in kitchens deserves the effort companies are putting into it. Little things like correct sink height for end of day washing up, to handy storage of oils and spices by the stove, can make all the difference. Delving through from a link on Mocoloco today revealed the Arclinea Mediterranean range. This little number, pictured, with a central preparation bench leading to an in-kitchen dining area is great. The preparation triangle is a little stretched - I can’t see the fridge but the larger layout works for me. Ideally there should be a preparation chain from fridge, to basin, to chopping board, to stove or oven. In the above, that would place the fridge beside the sink on the right. The final prep before cooking area faces out to the table where everyone not helping congregates. For me, the ideal chain is streamed into two. This meaning that the chopping and cleaning area need to be side by side. As cooking is a performance, when entertaining guests and flipping pancakes, the stovetop should be facing the table as well. The fridge, microwave and oven play minor roles in terms of attended time, placing them behind the performer, within reach, would be best. The above design shows a clear path from fridge, to chopping board, to stove, all whilst facing guests, or children playing at the table. The rubbish bin and dishwasher fit under the sink, along with pots and pans within easy reach of the stove and prep area with the plates and glasses in side units along the wall. Also, from waiting on the right side of the table, leaning back, you can peek at the oven. Technically, hafting to pipe water, gas, extractor and electrics in to the centre island is costly and difficult, but I think worth the effort. Ideally the wash, chop, cook setup would be reciprocated outside with the BBQ, yet against a wall for the BBQ flue. I’m not sold on ovens or microwaves being above waist height as they’re hard to lift in and out of. I do however like the idea of a double door fridge freezer and to top it all off, the must have - a large plasma screen TV - on the wall at the far end of the table, perfect for all to watch and out of the way.